When I was about 16 I started playing with Willem Breuker †, who back then only played the clarinet. At the time we were quite "avant garde" trying to sound like the Jimmy Guiffre trio (with Jim Hall guitar, Ray Brown, or Ralph Pena on bass). At this time I, although officially underage, often visited the Sunday afternoon jazz club; "Modern Music Club" in the Sheherazade in Amsterdam. Here I got to see many of the top jazz musicians of the Netherlands and some visiting artist from abroad, like e.g. Belgian guitarist René Thomas. That afternoon René was playing a vintage Gibson ES 150, not unlike the one you see on the top of this page. Thereafter I played with tenor saxophonist Hans Dulfer, in a piano-less quartet. For those of you who are not familiar with these two (Willem and Hans), Willem was up to his untimely dead in 2001 leader of The Breuker Kollektiv, while Hans is still going strong both in the Netherlands and internationally. 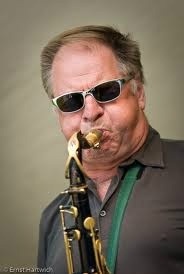 Hans is, by the way, the father of the internationally famous alto saxophonist Candy Dulfer.